Growing up, my mom always had a few recipes that she broke out for every holiday season: peanut butter kisses, magic cookie bars (a.k.a. seven-layer bars), cut out cookies with buttercream frosting, and date bars. The date bars were always mostly for dad-- they were his favorites. Well, I had a package of dates and needed to add a little diversity to my holiday cookie tins so I decided to try my hand at them. A great idea, if I do say so myself. 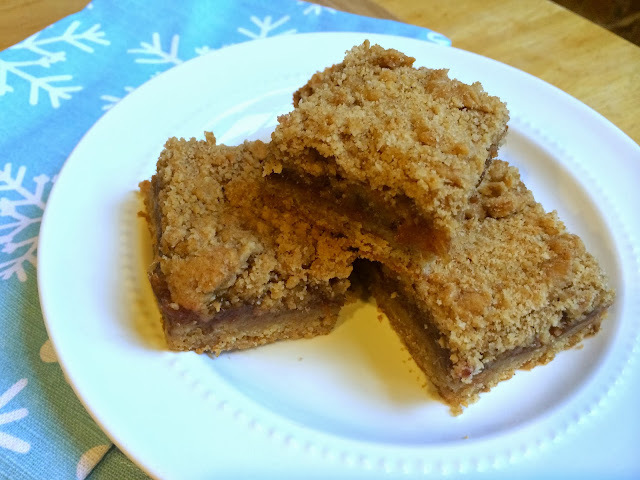 This isn't my mom's recipe--she and dad were on the road to the family cabin for Christmas when I was baking these. So, I did a little perusing in my cookbook collection and on Pinterest for inspiration and I think I came up with something pretty good here. 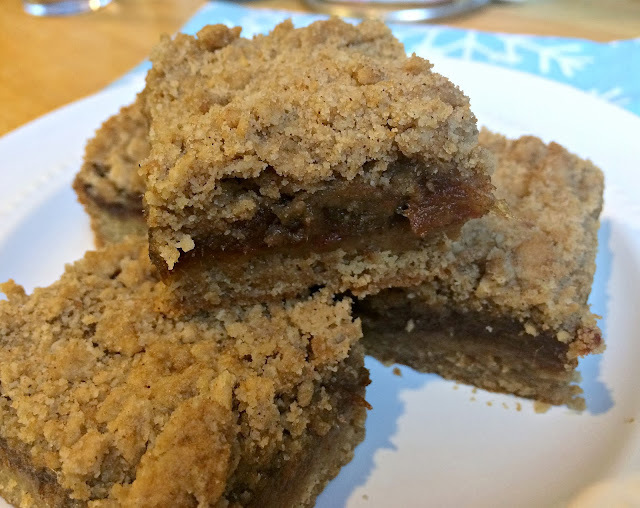 These date bars are a perfect combination of a buttery pastry-like crust and a thick rich date filling. And the results are delicious-- the perfect fruity pastry complement to the rich chocolate and gingerbread cookies I had already baked for the season. This recipe comes together pretty quickly. And dates aside, you probably have most of these ingredients in your kitchen already so they are a cinch to whip up too! 12 oz. packaged dates (n, pitted and rough chopped *I used (and prefer) Natural Delights Fresh Medjool Dates. You can usually find them in the produce section of your grocery store. Preheat oven to 325 degrees. Lightly grease an 8x8 baking pan with cooking spray. Place chopped dates in a glass boil and pour boiling water over the top, until just covered. Allow dates to sit for about 5 minutes to soften, stirring occasionally to break them up. After 5 minutes, carefully pour dates into a colander to drain water out of the mixture. Add the dates back to the glass bowl and stir in the maple syrup. In a medium mixing bowl, combine flour, baking powder, salt, sugar, and cinnamon. Cut butter chunks into the mixture with a pastry blender until large crumbs are formed and the butter is evenly distributed. Fold in the beaten egg to form a moist, but still crumbly dough. Press about 2/3 of the dough evenly into the bottom of the baking pan. 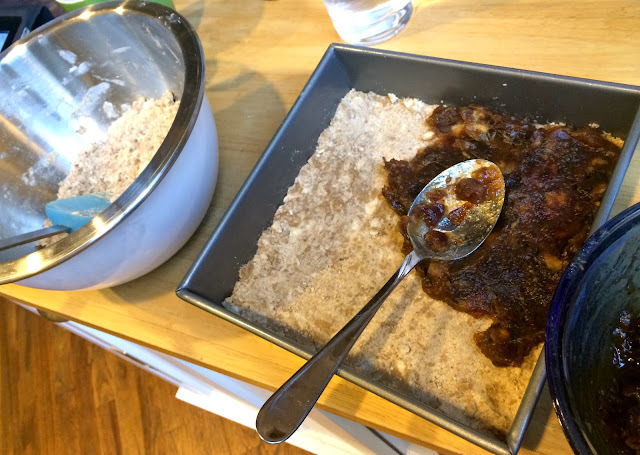 Spoon the date mixture over the dough and spread into an even layer with a spoon or spatula. Sprinkle the remaining 1/3 of the dough on top of the dates. Bake for about 35 minutes, or until the crumb topping turns golden brown. Cool completely before slicing into squares and serving. Adapted from recipe by Dough Puncher.